Recently the Swiss death metallers of Nihilo released Doom. DutchMetalManiac’s Tim van Velthuysen already reviewed Doom here. 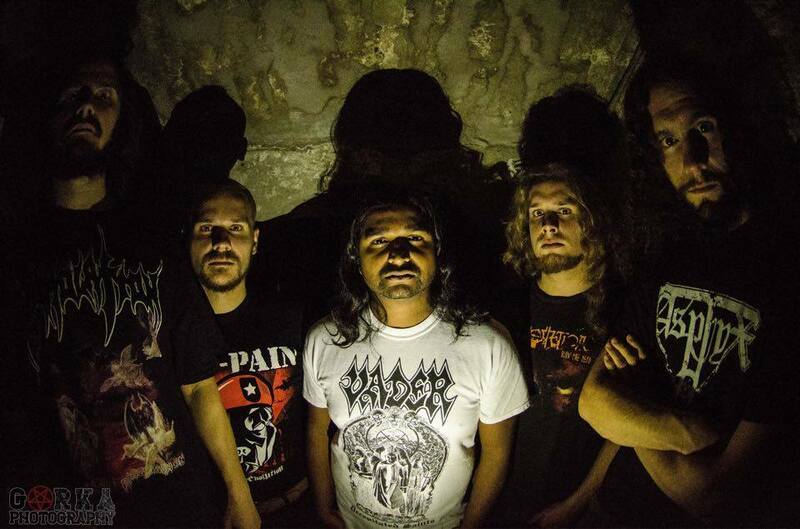 Now you can his interview with Nihilo’s drummer Damiano Fedeli below. Hey, I’m busy as hell but fine thanks. What about you? Thanks for the interview. I’m fine, thanks. Congratulations with your new album, Doom. I really like it! How did the creating process of Doom go? We started the songwriting already after Dum Spiro Spero or at least some minor stuff was already written afterwards. Most of the material was written right after the entrance of new axeman Marco Kessi. A lot of material takes form in our rehearsal room while jamming around or better around a riff/idea of one of our members and then the trip goes on. Every member gives inputs, that’s how Nihilo works. It is your first album together with Marco Kessi, who already joined Nihilo in 2015. Did this bring any differences during the creating process? If so, can you tell something about that? Yes it is our first record/album with him and he did a killer job, not only in terms of playing riffs and leads but also doing backing vocals and being the cool guy he is. He brings some other ideas and inputs, always trying to think the “Nihilo-Way” but also incorporating fresh elements into the sound. He came really quick with new riffs and songs, so he pushed the work on the album a lot. Check out his other band Defaced too. Killer death metal. The track Antichrist features guest vocals by Narcotic Wasteland- and ex Nile-member Dallas Toler-Wade. How did this collaboration come to pass? I have a soloproject called Darkreverie. I asked him If he would join me for some guestvocals. A few months after those recordings Nihilo went into the studio to record Doom. Since some vocal parts of the song Antichrist were made by ex-member Nicola, we asked ourselves if we want to record just the version we did in 2012 or if we want to change minor things, so we went for the idea to ask Dallas if he might be interested in doing some for that song too and he was all in and did a killer job. Cheers to him. To me, Doom has a clearer sound than its predecessor Dum Spiro Spero. When you compare these two albums yourselves, what do you hear? I think It’s maybe less “compressed”. It has more space, “breaths” more, although I think every record of us has that feeling but none as good as Doom. Every instrument is more balanced. It still remains “natural” without sounding too retro but has enough punch without going too much into “modern” productions. I am sure the reduced songwriting made the recordings for us and especially Remo Häberli easier this time. On both albums you worked with Remo Häberli in the studio. How is working with him? He is a very chilling guy, who knows how to work with a chaotic horde like us haha. The atmosphere in the studio is just fantastic, we love being there. He also can push us when needed to gain the best results without being too much of a drill sergeant. I only can recommend him and Hidden Stash Tonstudio. You released Doom via Art Gates Records. What makes them the best label for Nihilo at this moment? Art Gates is doing a great job with promotion and tries to push us to reach new levels. That’s what we want and need right now. Props to them. I really like the artwork of Doom, made by MFA XII. What made him the perfect person for this job? The title speaks for himselfs. Doom is what we wanted to show. We worked already with him and he is a fantastic artist. We knew he could deliver a killer art for such a title and surpassed our expectations. You recently shared the stage with Vader, Entombed A.D. and Mortuary. How do you look back at that? Propably one of the best shows in our career. Great venue and local crew, killer bands to hang with and that deliver live. Fantastic crowd who pushed us to the limit for a killer show. Also some new friendships were made, so total success. Can we expect some Nihilo shows in the near future? Maybe coming to The Netherlands? We got a lot of shows in November and December (record release, show with Mystifier and so on). We are working out some dates for the beginning of 2019. For bookings just ask Etrurian Legion Promotions (International) or The Best Of Underground (tbou, Switzerland). We played in the Netherlands in 2012 I think and we have some good memories about those shows. In this case I would like to salute our friends in Funeral Whore. Any other future Nihilo plans you can already tell us something about? As mentioned we want to play shows around the globe. Let’s see what will be possible in 2019. Depending on time and money the shoot of a videoclip and the writing/recording for a split and songwriting process for the next album is in mind as well, but that is still distant future and not clear at all right now. We will see.